A bipartisan group of lawmakers from both the House and the Senate on Wednesday introduced the Telecommunications Denial Order Enforcement Act, which would direct President Donald Trump to impose denial orders banning the export of American parts and components to Chinese telecommunications companies that are in violation of U.S. sanctions laws. Sens. Tom Cotton (R., Ark.) and Chris Van Hollen (D., Md.) introduced the legislation in the Senate, and Reps. Mike Gallagher (R., Wis.) and Ruben Gallego (D., Ariz.) introduced it in the House. The moves came after Canadian authorities arrested Meng Wanzhou, Huawei's chief financial officer, last month at the request of American prosecutors. Meng is facing charges in the U.S. related to possible violations of trade sanctions on Iran. 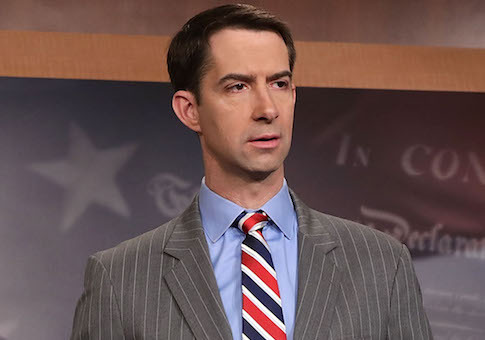 "Huawei is effectively an intelligence-gathering arm of the Chinese Communist Party whose founder and CEO was an engineer for the People's Liberation Army," Cotton said in a statement. "It's imperative we take decisive action to protect U.S. interests and enforce our laws. If Chinese telecom companies like Huawei violate our sanctions or export control laws, they should receive nothing less than the death penalty—which this denial order would provide." Van Hollen also offered a strong rebuke, saying that both Huawei and ZTE "have repeatedly violated U.S. laws, represent a significant risk to American national security interests, and need to be held accountable." "Moving forward, we must combat China's theft of advanced U.S. technology and their brazen violation of U.S. law," Van Hollen added. A press release included several measures within the legislation that the lawmakers hope will hold these telecommunications firms accountable. The members of Congress hope to establish "that it is U.S. policy to enforce denial orders banning the export of U.S. parts and components to Chinese telecommunications companies that have violated U.S. export control laws or sanctions." The press release also said that the bill would direct the president "to impose the same strict penalties originally faced by ZTE on any Chinese telecommunications firm found to be in violation of U.S. export control laws or sanctions." Another measure would prohibit all executive agency officials from modifying any penalty imposed on Chinese telecommunications companies, their agents, or affiliates until the president declares that the company has not violated U.S. law for one year and is complying fully with U.S. investigations. "If a Chinese telecommunications firm is found to have violated U.S. sanctions moving forward, it will be subject to the same severe punishment originally imposed on ZTE," Gallagher said. "Huawei and ZTE's actions to systematically undermine U.S. and allied cybersecurity show that Beijing does not wish to be part of the rules based system, but rather to break it," Gallego added. "I am pleased to have Senators Cotton and Van Hollen join with me and Representative Gallagher to show that attacking the United States, its allies, and the international norms that are the basis for China's own progress will result in severe penalties." This entry was posted in National Security and tagged China, Chris Van Hollen, Donald Trump, Sanctions, Tom Cotton. Bookmark the permalink.